The Greydog band is an experienced, professional band playing classic rock, blues, country, contemporary and original music. The band can play as a 3 piece, 4 piece or 5 piece unit depending on the venue and budget. 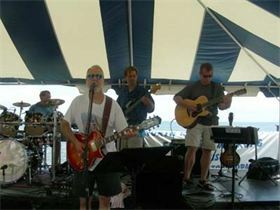 The band plays frequently in the Washington DC area in local clubs, conventions and private events. The band is tight and puts on a great high energy show and we are sure to please many age groups. We love to perform and have been doing so for many years. I don't think we ever had an engagement where we did not get fantastic response from the crowd. We have been asked back to play at every place we have ever performed! We would love the opportunity to perform at your event or at your place of business. Thanks, Larry Gershon. Please note GREYDOG BAND will also travel to Upper Marlboro, Capital Heights, Lanham, Cheverly, Glenn Dale, Capitol Heights, Greenbelt, New Carrollton, Bladensburg, District Heights, Riverdale, Brentwood, College Park, Hyattsville, Washington, Mount Rainier, Suitland, Beltsville, Crofton, Davidsonville, Southern Md Facility, Adelphi Chillum, Gambrills, Harwood, Laurel, Temple Hills, Lothian, Silver Spring, Takoma Park, Cheltenham.